An excellent opportunity to deepen your congregation's relationship with the Lord, these materials are a call to spiritual revival. George Muller of Bristol, England was born in 1805 and died in 1989. He and his partner Henry Craik led a restoration of New Testament Christianity and refused any denominational ties. Muller stood as a Gibralter in the stream of liberalism that emerged in his day. He was a builder of schools, printer of Bibles and tracts, supporter of missionaries and a father to more than 10,000 orphans solely supported by faith in his 64 years of ministries. He never asked for one pound, penny or shilling, relying on God to supply all his needs and those of the ministries he founded. During his 64 years, $7,250,000 was sent to him from every continent. Only on his knees did he seek the Lord’s help. No mass mailings, no telethons, no tent revivals, no telemarketing. 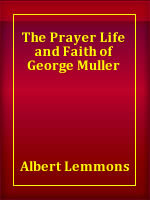 George Muller’s testimony is a pure example of God’s grace through “the effectual fervent prayer of a righteous man”. These 13 lectures are on CD and DVD, plus a historical DVD on Muller’s life.